Polyether impression material that combines the trusted performance and reliability of a polyether with the speed of a VPS. Impregum Super Quick is the first superfast polyether material designed for high-precision impressions in less complex cases like single-unit crowns, implants, inlays/onlays and smaller bridges up to 3 units. Improved taste and scent. 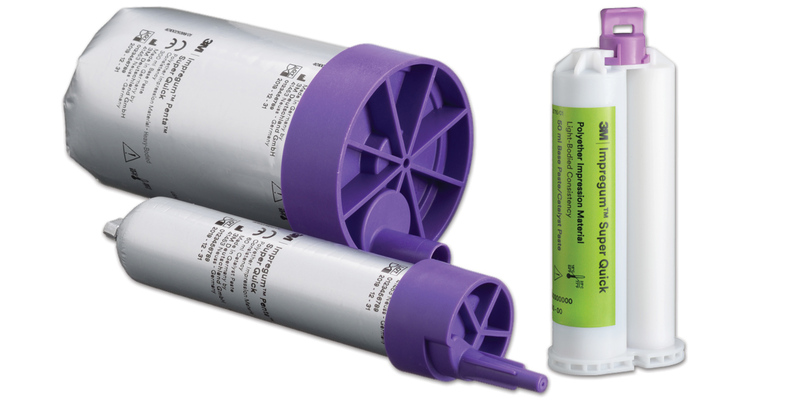 All viscosities 0'' 45" 2'' 00"
Contains: 4 x 50ml cartridges, 5 intra-oral syringes, 5 Garant mixing tips (purple). Contains: 2 x 300ml polybags base, 2 x 60ml polybags catalyst. Accessories: 1 Pentamix 3 HB cartridge, 10 Penta mixing tips (red), 5 intra-oral syringes (purple), 5 Garant mixing tips (purple), 5 intraoral tips (white), 1 x 17ml bottle polyether tray adhesive, 3 Astringent Retraction Paste capsules, 6 Dual Arch Trays (3 posterior, 3 anterior). Accessories: 1 Pentamix 3 MB cartridge, 10 Penta mixing tips (red), 5 3M Intra-oral syringes (purple), 5 Garant mixing tips (purple), 5 intraoral tips (white), 1 x 17ml bottle polyether tray adhesive, 3 Astringent Retraction Paste capsules, 6 Dual Arch Trays (3 posterior, 3 anterior). Accessories: 1 Pentamix 3 MB cartridge, 10 Penta mixing tips (red), 1 Penta Elastomer syringe, 1 x 17ml bottle polyether tray adhesive, 3 Astringent Retraction Paste capsules, 6 Dual Arch Trays (3 posterior, 3 anterior). Accessories: 10 Penta mixing tips (red), 5 intra-oral syringes (purple), 5 Garant mixing tips (purple), 5 intraoral tips (white). 1 x 60ml polybag catalyst. Accessories: 10 Penta mixing tips (red).